hmmm, not too sure on this one. lol I like my sushi the old fashioned way, raw. Sushi is also including in Junk food??? Sushi sushi...I eat Sushi for brunch for a year now...crazy with that. doesn't the microwave defeat the purpose of fresh sushi? I bought these but haven't used them yet. Any reviews? No, the rice is microwaveable. That's all. :D It comes with precut seaweed. And then it has instructions on how to wrap sushi with fresh veggies. Okay...I have to clarify something here for everyone who is talking about sushi being raw. "Sushi" refers to the specially prepared rice (which contains varying amounts of rice vinegar, salt and sugar) NOT the innards/toppings. eh, microwaved? sounds a little to far. Where can I buy? This looks fun to try with friends. 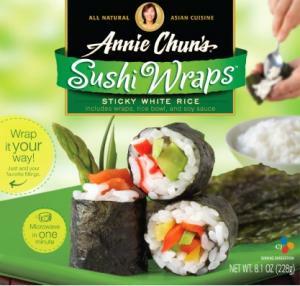 Ummm... microwaveable sushi? Isn't that, like, an oxymoron? I totally agree with you, Thank you for sharing this information, especially continue. Sushi is one of my favorite menu. This Japanese food consist natural ingredient and less processing. Microwaveable make me convenience that I can freeze it and reheat it when I want to eat it at home.